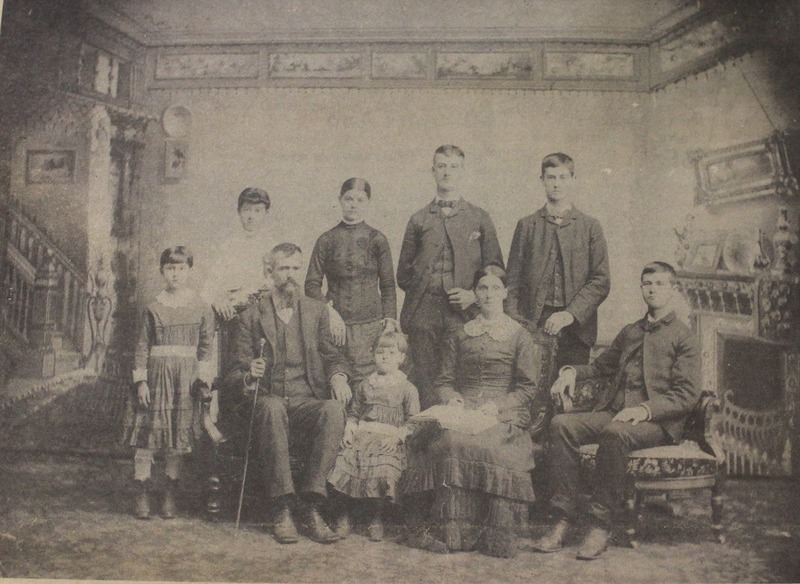 He wasn’t really sure what it meant on that hot day of July 8, 1863 when the draft registration man came by and wrote his name in the book with the other Vigo County men: Sugar Creek, Arthur, David M., 32, white, Farmer, married, Tennessee. In the days after that visit all everyone talked about was that Reb John Morgan had invaded Indiana. But soon the wily Confederate was run out of the state and all seemed as normal as could be with a war going on. He had not joined the war. He was a man in his thirties, with a wife, two children, a good farm to run. Perhaps he never gave it much thought. But a year later another man with papers came and David was drafted. On October 4, 1864 he assigned to Company I of the 57th Indiana. The 57 was mainly made up from Hamilton and Wayne Counties. Soon he was on a train for Indianapolis. Luckily his neighbor Wyley Black was also now in the unit. Things were a muddle. Many men hanging around, little or no equipment for the draftees. He thought it was all a bit of a mess. He was a farmer. He had no real training or skills for war. Nor was he to get them now. It had been a long time since he had been back in Tennessee. But the troop train had chugged across the border a while back. Now they were in Pulaski. He had been born about 200 miles west in Knox County in 1831. But he had moved to better land in Indiana with his family when he was a teenager. He had a good wife, good land, a good life. It was cold. Like the others he had no blanket or tent to ward off the November cold and rain. He huddled with Wyley and the others. His thoughts careened between his family and fear, and back again. Over and over and over. The Union Army had thought it finally had a pretty good hold on Tennessee. But it seemed that Confederate John Bell Hood was going to move his army from Alabama to try to recapture Tennessee. By late November, 1864 it seemed clear that Hood’s force were moving to relieve Nashville and force out the Union Army. In a December letter written to his family back in Terre Haute in December William Black, Wyley’s nephew, reported brother had seen “uncle wiley and david arthur running from the rebels.” Written by a young man not as close to the battle as Wyley and David it almost seemed if he was decrying them as cowards. What he did not know is that both had been injured. 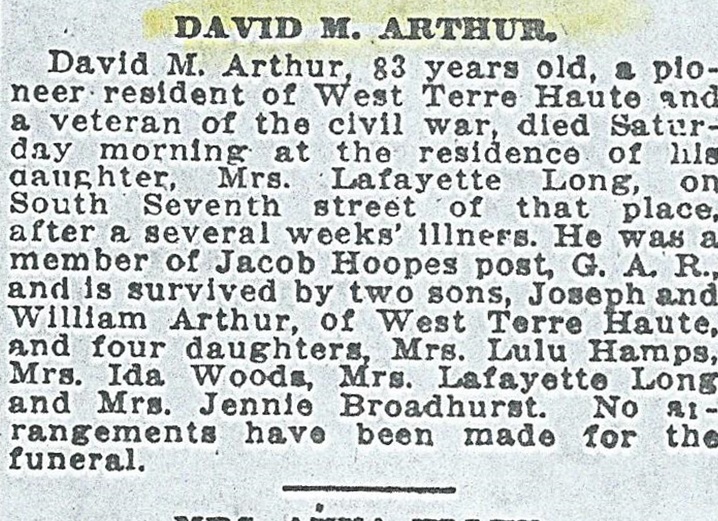 Artillery fire had blinded David Arthur. He was literally running blind to escape. Eventually taken to an aid station, David’s day as a “fighting soldier” were over. They lasted all of seven weeks. Eventually, he was moved to a hospital in Washington, DC and assigned to the Veterans Reserve Corp, groups made up of invalided soldiers who acted as guards or performed other menial duties. The highlight of his time was meeting Lincoln. David was mustered out in October, 1865 in Lincoln’s city of Springfield and took a train back to Macksville and his family. He resumed his life as best he could. He fathered six more children, farmed and had homes built for his family along the National Road. He received a pension of $24.00 a month as government compensation for losing his vision (actually a goodly sum for the times). Despite his blindness he remained an active, kind man. He was a founder of the Congregational Church. In 1899 his second youngest child Lulu married William Morgan Hants. In 1901 the couple’s first child, Hilda, was born. Hilda became devoted to her grandfather, assisting him with many small tasks made difficult by his blindness. David Marion Arthur died in 1914. He was my great-great grandfather.